Beginning Monday, March 13, new security policies will be in operation during the evenings within The Ledford Center. The Ledford Center is one of the busiest and most accessible buildings on campus. While we want to be as welcoming to the community, our primary mission is to serve our SEBTS members. To do so effectively, we want to create an environment that is as safe as possible without being too restrictive. We believe that limiting access to the building at certain times, coupled with some other safety measures, will help everyone feel more secure when using our facilities. At 9:00 PM each night, during semester hours, access to the Ledford Center will be limited to Southeastern Baptist Theological Seminary (SEBTS) members only with a SEBTS ID card, which will be required for entry. A SEBTS member can still access the Ledford Center prior to 9:00 PM without any form of ID. After 9:00 PM, everyone, including those already in the building will need to present a school ID to the employee at the front desk. No one will be asked to leave the building after 9:00 PM, unless they do not show a SEBTS ID and/or are in violation of the Ledford Center policies. Guests will not be allowed in the building after 9:00 PM unless they are with an ID carrying sponsor. If a SEBTS member has a guest and wishes them to have access to the building after 9:00 PM, the guest will need to present a picture ID (such as a driver’s license) to the front desk employee, who will then record their information. The guest’s ID-carrying sponsor will need to be present with their guest at all times. This restricted access during the evening and late-night hours to help ensure the safety of our students and staff. The Front Desk staff will be available to assist with any problems, answer questions, and monitor security cameras installed throughout the Ledford Center. Security is everyone’s concern. If you observe unusual, threatening, or unsettling behavior within the Ledford Center, please call Campus Security at 919-291-1903. 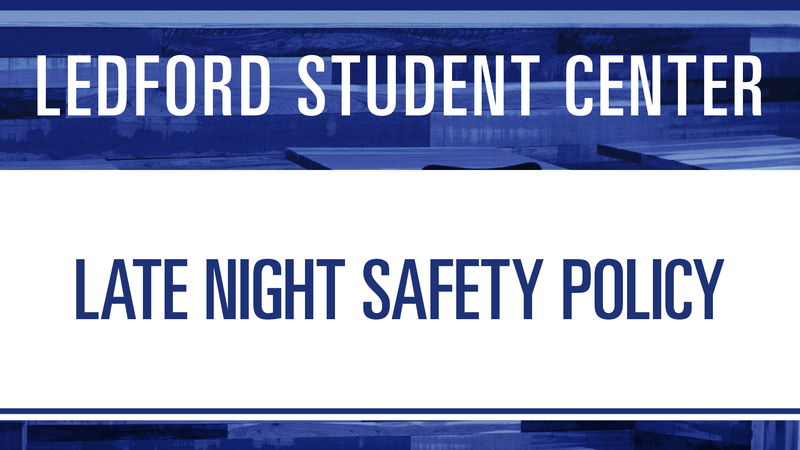 See the Ledford front desk for more information on the Late Night Safety Policy.